Here is an adaptation of the EA tremolo with the schematic done by runoffgroove. * Input buffer and main gain stage have been combined into a single MOSFET stage designed by Gez Paton. * The "pulsing LED" by Darren Inwood and Rob Strand. * Depth and Speed controls have been adjusted to my preferences. The first 25% of the original 1M Depth pot rotation resulted in no audible tremolo effect to allow use as a pre-amp. The Depth pot has been decreased in value with carefully chosen resistor values added before and after. The Rate pot value has been increased and a reverse-log taper offers a better feel. However, a linear or audio taper pot can be used for the Rate control with no ill effects. The 2k2 resistor which precedes the Speed control has been reduced for a faster maximum oscillation rate. "marrstians" reports that the pulsing LED can also serve as a status indicator when using a 3PDT bypass switch. Simply use the third pole of the switch to break the connection between the LED and the collector of Q3 when bypassed. this thing works great. LED mod too. Hi! First i would like thank for the layouts, these are awesome. I'm a new DIYer and was wondering if someone can help me out with this: BYOC tremolo kit is also based on EA Tremolo, but it's a bit different. Can someone give me some insight on that? Mainly why byoc has 4 transistors? Have you got a link to the BYOC Tremolo? It's labelled modified in this layout because that's how it's described on the ROG schematic. Has anyone experienced distortion with this, and has anyone used 2SK170 on Q2? What you describe is not how it normally functions, you have messed up somewhere, are you sure you have the right value pots? I'll check again and again..
Hi there. Thank you so much for all these layouts and sharing them with us. They must take alot of your time and I really appreciate it. 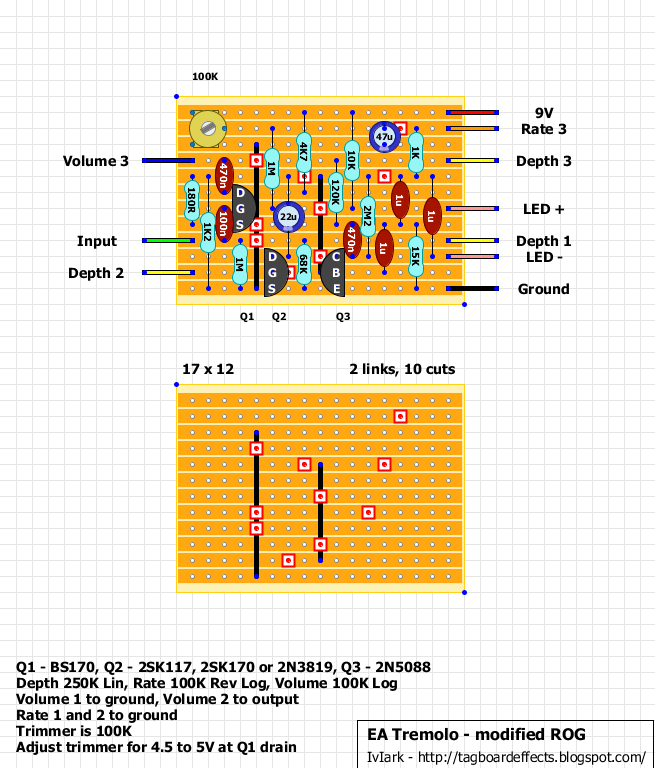 I'd so appreciate it if you could do a layout for the BYOC tremolo. The schematic for it is on the build doc on their website. The BYOC is a modified Dyna Comp. So you've got the Dyna Comp layout here, Ross Compressor, Keeley Compressor or Emma TransMORGrifier which are all variations on the same circuit and will be similar. You have any thoughts on how to do the dual depth mod for this? I built this with a Torchy and a Dragonfly layout unsuccessfully. This one fired up right away. The tapers are great, and it is pretty much as Fendery as I wanted it to be. I've built this one up over the last few nights. Tonight was the big turn on :) Not a complete failure (yet!!). I'm getting a lovely clean signal through but no tremolo (the depth and rate pots are having no impact at all to the signal. Also, the LED mod, which should pulse with the rate time is just constantly lit. This is only the second pedal I've made, so I could have made a schoolboy error somewhere but I've checked over things a few times and can't yet figure this one out. Any help would be appreciated, I'm sure I'm not far away on this one! It works!! I have tremolo!! I used a couple of equivalent transistors ( I used a 2n7000 and a BC550 in place of the BS170 and 2N5088) in this build purely because of availability. This is what caught me out. The pins were reversed so I had 2 0f the 3 transistors soldered in the wrong way around!!! No wonder it didn't work. Now I've got tremolo and a decent level/volume. Really satisfied that I've built this and its working but I am disappointed with the lack of tremolo depth. I've used a 250k lin pot for the depth, I don't know what impact that has on effect depth but its not currently getting deep enough. Its currently (with the depth pot at 10 (100% on)) very mellow, barely cutting in to the dry signal, basically its max depth setting is what I would use as a subtle tremolo. What can I change or what do I need to review to get the depth control working properly? Built this tonight and I've got the pulsing light and a great boost, but signal is passing through as tremolo. I've used 2N7000, MPF102 and a BC550. I too need some help with this. This is the first board i've put together from this site - firstly i'd like to say what a wonderful place this is!! thank you so much for all your amazing work! So, my build's gone pretty well considering I'm a maximum noob. The vero board layout was so easy to follow - all instructions clear - great! The board powers up, LED lights up - great! Sound comes through and the boost works fine - great! The interesting thing is it does work, but only for a second if I disconnect, then reconnect the LED - the light dims and fades back in, and the volume swells. But this effect is only momentary, as though a capacitor is charging to capacitance, and when fully charged - 'no more trem for you'. - Remade all connections (encase of cold solder joint). - Searched the board several times to look for shorts, and run a scalpel between the tracks on the vero. I know I'm close to having it working. Just as 'myfriendtom' posted in June, I have no voltage the other side of that 22uF Electrolytic cap, and nothing on any of the pins of Q2. Decided to go through every earthed component, testing that they were making a good connection to ground with my multimeter. Sure enough the 15k resistor that grounds those 1uF caps by Q3 wasn't making good contact - blobbed some more solder on, and everything works perfectly!! Super chuffed! Stoked in fact. Guitar tech for a tour this week, but when I'm back going to house this little puppy. I just built this pedal using the 2N7000 for Q2. It worked with Q2 in both orientations, however the tremolo is very choppy and almost square wave sounding. I swapped Q2 for a 2SK30 and it's perfect now!! If you cant find the recommended part for Q2, use the 2sk30. The round side of this the 2sk30 as Q2 should be facing the left of the board. Also, the 2N7000 caused the knobs to function strangely. The trem would suddenly cut out when I turned the rate up, or down, and it was annoying. The new q2 fixed that up. You should really incorporate RC filter for 9V supply. It's super easy to add! Cut at fourth hole, first row. Add 100R resistor across the cut and add a 100 uF cap across first and third row. Solved all my noise problems. I also replaced 180R resistor by a 1K Lin pot. It allows me to control the amount of distortion from the MOSFET, all the way from very clean to nice vintage overdrive. Very very nice tremolo this is! I really struggled with this one today. Built it and it worked perfectly. Boxed it up and that worked fine, too. Until I plugged in the guitar and the pulsing indicator stopped pulsing. I made a sloppy soldery mess trying to reconfigure it a million times, but in the end had to settle with the 'indicator always on' option (pre-'modified' version) The thing that's killing me is that I really think I've gotten this working in the past! Gaaa! Anyone had this problem and solved it? I just built one of these and it works fine. I do not have much knowledge of electronics, so I have a little doubt: removing the volume pot (100K Log) where / how would my output be? Would I simply use the point indicated with "Volume 3" for this? 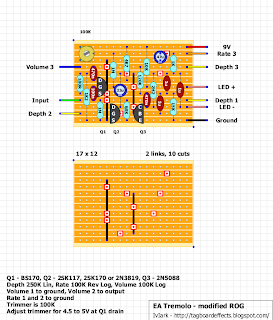 Would I have to add some more resistor / cap in the layout? What I intend is to use only the guitar voluma pot. Any help would be welcome !!!!!! Excuse me, but my English is not very good because I'm from Brazil. I might be nuts, but is the graphic representation of Q2 backwards given the pinout of the 2SK117?